If you`re looking for somewhere completely unique then you`ve found it. This charming little treehouse, the only one on the beautiful Isle of Wight, offers luxurious comfort within peaceful, private surroundings. You won`t get closer to nature than a holiday in a treehouse. A treehouse holiday is fantastic for adventurous families or groups of friends looking for a quirky getaway, but is just as wonderful as a romantic break for couples or as a haven for nature lovers. You need only one thing in common - the desire to go somewhere utterly original. Situated on the North East coast of the island, just a few miles from both the Red Funnel and Wightlink ferry ports, the treehouse sits just outside the country village of Whippingham and is surrounded by picturesque farm and woodland. Everything has been provided to enhance your stay, from smart bed linen, fluffy towels and shower gel to basic kitchen ingredients and a selection of books, puzzles and games. A stay in a treehouse is an experience you will never forget! The treehouse is completely private and surrounded by nature. There is a wealth of wildlife around, from red squirrels and rabbits to owls and woodpeckers, not to mention the horses, cows and sheep from the surrounding farmland. There are bikes available to hire and shooting lessons/practice are available on site, as well as children`s mini tractor rides. We also offer speedboat charters, which are brilliant fun for all ages. The Isle of Wight is jam-packed with things to do and see, whether you want to visit historic castles, take long coastal walks, try a spot of sailing or just sit on a beach eating ice cream. Visit the Victorian town of Ryde or the quintessential English village of Seaview, wander round Cowes watching the boats sail in and out, explore Carisbrooke Castle or enjoy the amazing views over the white cliffs at the Needles. The Isle of Wight offers an idyllic British seaside setting and a holiday in a treehouse is the perfect base from which to explore it. Full directions will be provided upon booking. Newly built to very high standards, the treehouse is divided into two separate areas - the Living House and the Sleeping House, which are joined by smart decking. It sleeps 4-6 people and is lovingly furnished with lots of natural wood, slate and stone, so it blends stylishly into its surroundings. The Living House comprises one lovely timber-clad room with a kitchen area, a dining table and benches, a sofa and a wood burning stove for keeping cosy. The Sleeping House comprises two bedrooms (a Master with a king or two singles and a room with enclosed bunks) and secret additional sleeping space for two adventurous extras! There is also a bathroom with a loo, a washbasin and a shower with views into the trees. We have purposefully not installed TVs and hope that this will encourage conversation and good old-fashioned play! But there is free WiFi so you can keep in touch with the real world if necessary. In the Living House, French doors open out onto a sunny decking area which is perfect for al fresco dining and relaxing. This is the most beautiful, tranquil place for a cup of tea or a game of scrabble! The treehouse is situated in its own private paddock and it sits in a wooded area on the edge, with the front decking area poking out. The deck gets sunlight all day long (assuming there is some!) and the paddock is totally surrounded by farmland and lovely views. When you arrive, you will park in our private woodland car park, and then you follow the secret path down to the treehouse. A cart will be provided to take your luggage. On site there is an honesty shop full of home-grown and homemade produce, there are swings, rope ladders and outdoor games to play, and there is also a BBQ area down below. The kitchen is fully equipped for cooking and dining, however in order to be as green and natural as possible, there is no dishwasher, microwave or washing machine. Eco friendly products are provided in the kitchen and the bathroom, as the waste water runs away through a reedbed back in the woods. The loo is a super-efficient Scandinavian electric composting toilet, which is very high tech and functions just like a normal one. For kitchen food waste there is a special composting area. We have plenty of friendly chickens and ducks who will be more than happy to provide you with fresh eggs, and deliveries of other island produce can be arranged from local farm shops. 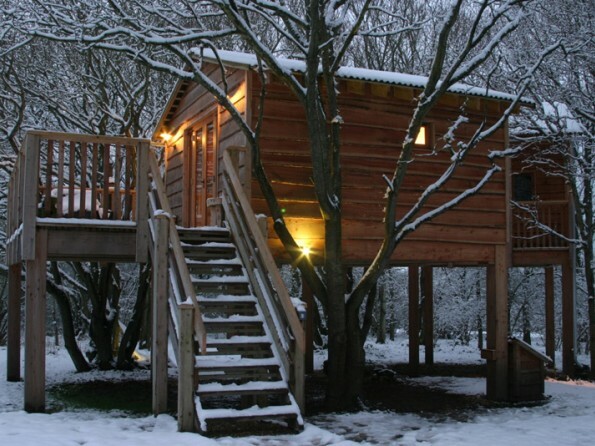 Babysitting is available in the day and the evening, but a treehouse holiday is really only safe for children over the age of 5 years, as the ladder and bunks are fairly high. If there are more than 6 of you, we are in the process of creating another cabin, exclusively for friends of the treehouse occupants. We also have some gorgeous bell tents with carpets and comfy beds. Do contact us for further info.